This morning we picked up a hire car in Boston and drove the 165 miles to our next stop at Boothbay Harbour on the Maine coast. The weather was mostly overcast, so there were no opportunities for photo stops, but we did stop for lunch at Kittery just after crossing the state border into Maine. In the evening after we arrived at Boothbay Harbour the weather improved, so we went for a stroll to explore and take some evening pictures. 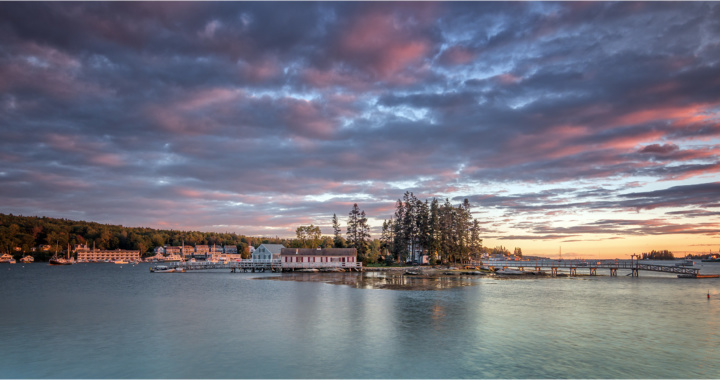 Boothbay Harbour is a small coastal resort village situated on the west side of a sheltered bay on the Boothbay peninsula. There is a footbridge across the bay with an old house called the Bridge House part way across. There are also plenty of jetties and boats, giving lots of photo opportunities. Our accommodation in Boothbay was the Inn at Greenleaf Drive, which was close to the centre, with pleasant views across the bay. Today we visited the Coastal Main Botanical Gardens, just 3.5 miles north of Boothbay Harbour. The gardens are fairly new – planting started in 1996 and the gardens opened to the public in 2007 – however they are well established and cover an area of 270 acres, with numerous formal gardens and a large woodland area. There is also an excellent restaurant for lunch, so we managed to spend the entire day there, visiting each of the gardens in turn and exploring the many woodland paths. One of the attractive features of the gardens are the numerous sculptures and buildings which make interesting photo subjects. We also came across some insect life which allowed us to try out some natural history photography. On our last day at Boothbay Harbour, we decided to explore the coast a little. Most of the coastline is under private ownership so is inaccessible, but there are some locations where it is possible to get down to the water. In the early morning we walked over the footbridge and around the bay at Boothbay, then we drove to Ocean Point. Boothbay peninsula is shaped like an inverted trident, and Ocean Point is at the southern tip of the eastern arm. Here there is a short coastal path and views out to Ram Island Lighthouse. Then we drove to the Southport peninsula which forms the western arm of the trident. We stopped at a small beach at Hendricks Bay before continuing to the far southern tip of the peninsula at Cape Newagen. On the way back to Boothbay, we stopped for pictures of the jetties at Robinson’s Wharf in Southport, and at Boothbay harbour itself.